"Do it your way” with this salt and seasoning-free fish fry. Cooking Directions: Preheat oven to 425°F. Moisten Chicken or pork on all sides with 1 - 2 eggs, beaton thoroughly. (Number of eggs used depends on the amount of meat to be coated). Coat meat completely in LA Fish Fry Seasoned Panko Bake. Shake off excess. Bake bonless chicken or pork in baking pan for 20 minutes. Bake bone-in chicken or pork for 40 minutes. Cook meat to an internal temperature of 165°F and until golden brown. 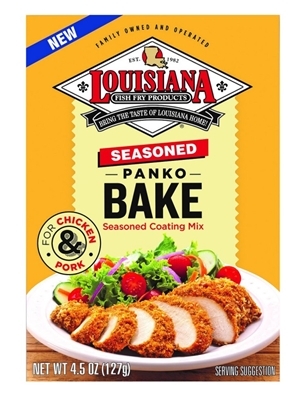 Ingredients: Panko Bread Crumbs (Bleached Wheat Flour, Dextrose, Yeast, Sugar, Salt), Salt, Spices, Yellow Corn Flour, Paprika, Dried Garlic, Enriched Bleached Wheat Flour (Weat Flour, Malted Barley Flour, Niacin, Reduced Iron, Thiamine Mononitrate, Riboflavin, Folic Acid), Hydrolyzed Vegetable Protein (Hydrolyzed Corn Gluten, Safflower Oil), Dried Onion. CONTAINS WHEAT.